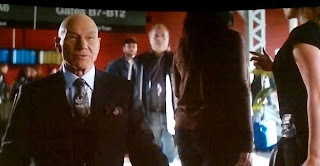 Ok, I felt we probably had to talk a little bit about the mid-credit scene for The Wolverine, and there are a few quick observations I wanted to make about the film itself and its possible ramifications for the X-Men franchise. Needless to say, do not read further unless you've seen the film or don't mind having some key elements of the movie (as well as X-Men: The Last Stand and some possible plot points of the next X-Men film for that matter) spoiled. Ok, let's start with beloved Yukio. I can't tell you how relieved I was that she actually made it out of the movie alive! She reveals she's had a vision of Logan dying and accompanies him on his mission, which results her being caught in a duel with an angry Shingen while Logan struggles to perform surgery on himself. I was dead certain she would end up being mortally wounded in the fight and reveal that she had foreseen her own death but acted as she did anyway to protect him. But her survival and her accompanying Logan on his future travels opens up great possibilities. If they forge ahead with another solo Wolverine movie down the line, I'd love to see these two continue as a double act. There's a sense that Yukio has a bit of a crush on Logan (just watch her reaction as he says farewell to Mariko) but first and foremost there's a sense of respect between them wherein they seem to be equals. They would make a great pairing. Another big change in the franchise: it looks like Wolverine's bone claws are back for a while. During his fight with the Silver Samurai (actually the elder Yashida, not as dead as we were led to believe in a twist you can somewhat see coming), Logan's adamantium-coated claws are hacked off by a plasma-heated adamantium sword and heal into the original bone-form he possessed in the beginning of X-Men Origins: Wolverine. The mid-credit scene, which takes place a few years later, reveal he never had them fixed, which I thought he might have considering that once Yashida is permanently killed, there's a nice big heap of spare adamantium lying at the bottom of a cliff that they could heat up and brush back on there. Given the usual tendency of comic series and movies to maintain the status quo and not endure any lasting change, this is a surprise. However, I wouldn't be surprised if it's a development that gets reversed somehow in the upcoming X-Men: Days of Future Past. A few more notes on that ending; how cool is it that the film's two primary villains, Viper (aka Dr. Green) and Yashida are really taken down by the female characters. Yukio kills Viper on her own and while Logan applies the coup de grâce, it is Mariko who strikes the blow that stops Yashida and saves Logan's life. I also have to say that the procedure through which Yashida attempts to drain away Logan's regenerative abilities and kill him in the process is, while unwieldy, also effectively creepy. There's something really unsettling about seeing this robust hero we've cheered on slowly withering away to a dead husk. Ok, onto the big scene: After some of the credits, we cut into Logan at an airport two years after the events of the film (a time frame which again allows for possible Logan/Yukio adventures). Yukio is notably nowhere to be seen. As he's passing through airport security on his way to the U.S., he notes a TV commercial playing on a nearby monitor for Trask Industries, the company headed by Bolivar Trask, whom X-Men fans know is responsible for creating the Sentinels, giant mutant-hunting robots that we've had hints of throughout the film series. Of course, Logan opts out of going through the metal detector but he notices that the metal objects that someone else has put into the tray are beginning to shake and move. He turns to face Erik Lehnsherr, aka Magneto (Ian McKellen), standing before him, confirming that the effects of the mutant cure he was injected with in X-Men: The Last Stand were indeed temporary. Wolverine rears back to hit him (popping his bone claws, proving he still has them), when Magneto freezes him in place and warns "There are dark forces, Wolverine. Evil forces building a weapon that could bring about the end of our time. I want your help." Logan snarls that he doesn't trust him, to which Magneto responds that he knew he wouldn't. 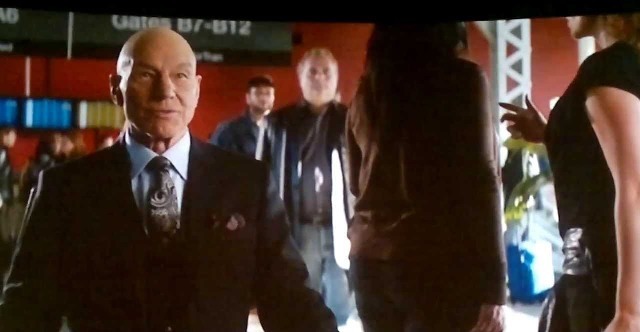 ...the previously exploded Professor Charles Xavier (Patrick Stewart). As Logan wonders how he could be alive, Xavier reminds him that he's not the only one with gifts. 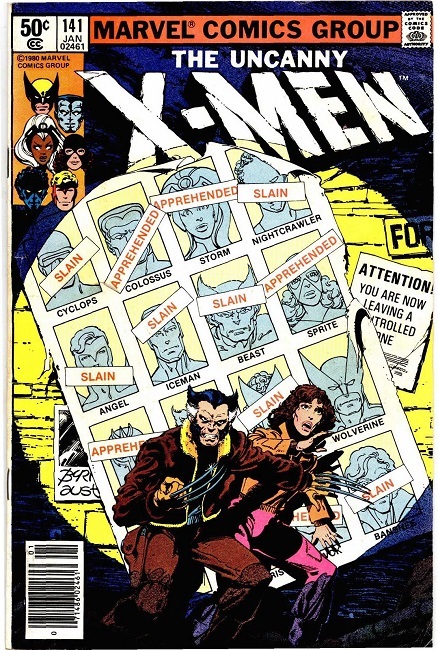 ...it concerns a dark future in which most of mutant kind has been wiped out by the Sentinels, who have taken control of humanity for its own good and rule over a post-apocalyptic Earth. One of the few surviving X-Men, Kitty Pride (played in the movies by Ellen Page), is sent back in time to warn her fellow X-Men in the present and prevent the key incident that starts the chain of events leading to this possible future. It's already been made clear that Logan is the central character so it may be that the time travel element has been abandoned or he may become the character who travels back. Whichever way it works, this is the threat Magneto's talking about and which has been foreshadowed by the Trask ad. Since Yukio has survived The Wolverine and can predict the deaths of those she meets, it's possible she may be how Xavier and Lehnsherr discover the threat exists, with her ability revealing the violent elimination of her fellow mutants by Sentinels in the future. If they're not using the time travel aspect of the story, this would be one way to make it work and I'd love it if she makes an appearance in the film and gets to fight alongside the X-Men. It'll also be interesting to see how the next movie will deal with Xavier's resurrection. Technically this was already pretty much explained in The Last Stand's post-credits scene, in which it was hinted that Xavier's consciousness took over the brain and body of a brain-dead coma patient. Whether they'll stick to that is up for grabs, but it's another hint that The Last Stand's place in the continuity hasn't been wiped away yet, though the multiple timelines of the next film may give them just the chance to tweak things. Anyway, you don't need to be precognitive to see that some interesting things are shaping up in the X-Men world. The far-flung future of summer 2014 looks exciting indeed.